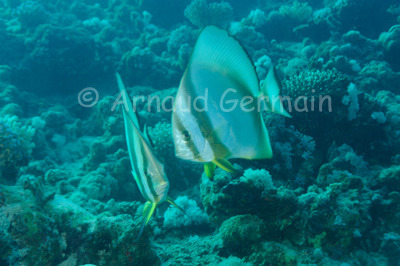 I came across these two circular batfish inside Marsa Shagra Bay. Having seen batfish before, I went lower than them and approached very carefully and slowly, trying to reduce my breathing. I managed to get quite close without spooking them and got a nice series of pictures. Nikon D700, Nikon 28-105 mm macro at 60mm F8, 1/60th, ISO 400, Ikelite Housing and Ikelite DS160 strobe set on TTL.